We are standing in the shadows of a new time. We are on the verge of a "Daybreak" that will reveal what History would call "2014": The Year Two Thousand and Fourteen AD. I dare you, to now begin a 72-Hour Countdown into what you will make your greatest year ever. Cleanse. Clean. Disinfect. Rinse. Mind-Body-Spirit. God Bless You. Enjoy the rest of this beautiful day of which you are privileged to be a part. Refresh yourself with laughter! A large percentage of Africa’s human capacity, the “Brain” of Africa, resides in the Western Diaspora. To you, Diaspora Africans: Take the time to sit your young children down and explain to them just who Mr. Nelson Mandela was. Enjoy your weekend. Know that the Lord Jesus is watching over you. Africa has lost one of its greatest statesmen. A leader who chose a 27-year imprisonment over compromising his principles, so that others born in the same country as he would taste freedom, and experience democracy. A leader who sampled the sweet lure of power after 27 years of confinement in an isolated jail cell. Nelson Mandela tasted life in the highest office of his land, South Africa. And graciously relinquished that power after a mere five (5) years. Preferring that some other more vibrant, more able, could bring to his people what He, Mandela, had spent 27 years being imprisoned for—Wanting the Best for His People. This Christmas Season give a gift that warms the heart and stirs the spirit. Share the Christmas story of God’s Love. Tell another that God’s love keeps on giving and giving and giving! 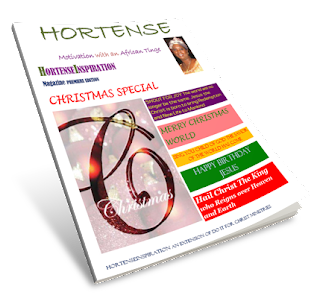 Order your copy of HORTENSE (the HortenseInspiration Magazine). Why do you worry so much that you look imperfect? Stop wasting all your energy remaking the beautiful you God has created. My friend, I share this that someone out there would know Jesus is fully aware of you and happenings in your life. I believe that in the process of making you to come out like pure gold you must be refined by hot fires. In order to purify that gem the Lord is making you out to be, you must be put through burning flames. Stay prayerful. Stay cheerful. You have not yet suffered to the point of dying on a cross. If you must be like Jesus, you must be like Jesus. Keep your focus on God. Absolutely, everything about earth is temporary. Maybe, just maybe, the Lord wants you to understand and know there is no place life can take you that the grace of God cannot reach and rescue you. Merry Christmas! Merry Christmas, to all of you. It is my greatest joy to bring this first edition of our magazine to you in time for the Christmas holiday. Christmas always brings out the child in me. My excitement is just too much. And it is infectious. I pass it on to everybody in my path. Celebrate Christmas, my friend. Whether you have much, do not have much or have nothing at all, it does not matter. Enjoy the season. Pray. Laugh. Spread Joy. Eat. Show Gratitude. Shop if you can. Pray! Hug your loved ones. Jubliate Deo! Trust God to be Lord of your life. Try not to complain for the next seven days. Just be merry. Share the Christmas Story of Love. Thank you for your support of our work and ministry. God Bless You. My friend, Sing Along and make your heart happy. You could never get so grown that these lyrics do not make your spirits glad. God bless you. Enjoy the singing or humming, whatever you choose. The Word says, “I beseech you therefore, brethren, by the mercies of God, that you present your bodies a living sacrifice, holy, acceptable to God, which is your reasonable service” (Romans 12:1 KJV). Now, my friend. NOW is the time to follow Jesus, and stay with the Lord. Take a minute today to step outside that building. Find a patch of nature and smell the flowers. Let the smell of God's perfect creation scent up your life with the fragrance of how great our God is! The Lord is eternal, forever. The Lord is in total control. From everlasting to everlasting He is God. Jesus Christ Is Lord. Let every knee bow and every tongue tell it that Jesus Christ is Lord! My friend, smell the flowers today. If God so beautifully clothes and nourishes the plants in the field, how much more will He masterfully take care of you! Pause and appreciate God in His perfect holiness. Embrace the sweet fragrance of Jesus Christ. For my part, I salute JESUS! The Bible says, "Remember the Sabbath day to keep it holy." (Exodus 20:8). My friend, be respectful of Jesus by how you treat Sunday. Dedicate this day to the Lord. My wish for you today is that you would discover how much a gem you are. So much a gem that Jesus came to earth and died to make you faultless, in the eyes of God. "The Lord is my light and my salvation—whom shall I fear? The Lord is the stronghold of my life—of whom shall I be afraid?" (Psalm 27:1 NIV). The Word of God is potent. Hide it in your heart. It will change the way you walk through life. Are you on fire for Jesus? If not why not? ALMIGHTY GOD says, "And if you ask yourself, 'Why has this happened to me?' --it is because of your many sins that your skirts have been torn off and your body mistreated." (Jeremiah 13:22). Be encouraged, motivated, and inspired: Visit www.doitforchrist.org. Whether or not you have reason to laugh today is not the issue. Laugh anyway. Inside of you dwell the potency of the Living God. Most Africans know that to restart the fire in a “coal pot” all you need do is blow at the embers. So it is with the Child of God. Utilizing the strength Jesus Christ has imbued in you blow with all your might. Soon you would feel the warmth of His glory overtaking your fatigue. There is a lit flame inside of you, Child of God. Persevere. That’s how you restart the passion in your life. That is how you break a smile! And loud laughter follows. DO IT FOR CHRIST MINISTRIES is 14 YEARS OLD! Fourteen years ago today I stood in the face of Jesus Christ, answered my name call, received the Lord’s anointing and heard the Words of Calling. In awe, I listened to my Master speak an assignment for me. Hallelujah! It has been 14 years! God has been faithful to me! Many times beaten, broken, weary, left along the way. Often times, discouraged. Sometimes, a little depressed. Bouts of wavering faith. Feeling that God had abandoned my ship. But ALL the time, prayerful, hopeful, joyful, and firmly following. Laughing right after the tears. Smiling through the crying. Happy that “There is a fountain filled with blood, drawn from Immanuel’s veins; And sinners, plunged beneath that flood, Lose all their guilty stains.”I rise and realize that I am blessed. So richly blessed! I cry out, “Lord help my unbelief!” And I go right back to what I know to do: Trust God regardless of any and every circumstance. Always God does, in His time, what He knows best to do: Be faithful to me, a wretched, sinful, unfaithful human being! The God of the universe holds me close, and imprints a mark of joy that penetrates my bones, my muscles, my tissues, my joints, my nerves, and it consumes me. God’s peace and provision and providence consume my entire body. My flesh becomes a haven of rest because Jesus choses to dwell in me. God is faithful! The Lord is faithful! Yes God has been faithful. To me. Hallelujah! It’s never been about me. It is because of WHO HE IS. All because of who Jesus Christ Is. I AM is all I could ever want. I AM is enough! My friend, I AM is enough for you, too. Christians, in your Walk hold on to Jesus. God did not promise the easy route. GOD promised to NEVER LEAVE YOU. You Stand! PRAY. STAND. Pray! Live for Christ. Stop settling for ease. Ease is loss. Ease without total Jesus is total loss. This world is not all that. Do those things that dishonor God really make you happy? Does living outside of Jesus Christ and doing ungodly things bring you true joy? No it doesn’t. And it never will. God deserves better. God deserves better from you! Body, mind, spirit; you owe yourself to the Lord. Lay down your own desires. Set boundaries and standards that your life and lifestyle may worship God. NO, the Journey is not a picnic all the time. But I guarantee, all the time it is a Feast. Never a hungry day in Jesus! The way you live for Christ is you ask the Lord to Decrease you and let Him, Jesus Christ, Increase in you. That’s how you live for the glory of God. You surrender your life and lifestyle to the doings of Almighty God. You let Jesus lead. You follow using the Bible as your guide. You DECREASE self. You let the Holy Spirit be your conscience. You INCREASE Jesus. In Jesus there is unspeakable joy. And lasting laughter! Crowns of peace. At the end you WIN! Ahh my friend, YOU Win. "And whatever you do, whether in word or deed, do it all in the name of the Lord Jesus, giving thanks to God the Father through Him." (Colossians 3:17). JESUS CHRIST, acclaimed Promised Keeper, says, “Therefore do not worry about tomorrow, for tomorrow will worry about itself. Each day has enough trouble of its own” (Matt. 6: 34). Those who know me well, you would know that fun and laughter is my trademark. My closed friends and loved ones often call me for comic relief. And a few of them are "brave" enough to tell me, "I'm calling because I need to laugh!" So my joke today is on Lucifer. SDL is having a stroke! I have been rolling this morning since 5:25 a.m. Writing, tweeting, on facebook, broadcasting, talking, emailing, and am about to complete work on a newsletter. Satan Devil Lucifer should have left me alone yesterday. He wouldn't be so stressed out today trying to keep up with everything I have to say about JESUS! Ha! Ha? HAHAHA!!!! My friend, the only thing Satan knows to do well is to make the testimony long, for the child of God! Find something to laugh about and keep moving. My friend, I'd like you to know that the God I speak about, and the things I say about Him I know in my heart to be true. Yesterday was very challenging healthwise. My body was not cooperating. Pain was oozing from every joint, bone, and muscle. I've learned to expect such days. Those days come, and like all things it come to pass! I took the day easy. Being in one spot frees up an entire day for praying!!! (Deut. 28:13) "The Lord will make you the head, not the tail. If you PAY ATTENTION to the commands of the Lord your God that I give you this day and CAREFULLY FOLLOW them, you will ALWAYS be at the TOP never at the bottom." My friend, if you ever needed an anthem, take this verse and RUNNNNNNNN with it! God did not promise ease all the way, but The Lord promised some big, big things! Where ever you find yourself today this verse is for you. You, yes You sitting over there, have been declared permament top placement. Live your life for Jesus. You will never be the bottom as long as you live for the glory of God. Do It For Christ! Be encouraged, motivated and inspired: Visit www.doitforchrist.org. "O taste and see that the Lord is good: Blessed is the man who trusts in Him!" (Psalm 34:8 NKJV). My friend, Read Your Bible. Pray Every day. It will make you Grow. Life must be about growth! Do not remain stagnant where ever you are. Let yourself grow in Jesus. The Lord provides grace for your growth. Receive His grace. Growth is good for you. If you ever thought SDL isn't following your daily walk and getting angry at every praise you utter about Jesus, think again! Mr. Satan Devil Lucifer watches every word you utter about God and it scares the daylights out of him so he tries to squash you. Yesterday he was following me foot-to-foot and made it one of the most frustrating days I've ever lived through. BUT, ...with my majority shareholder, Jesus, we crushed him up. And again Still I Rise! So shall you too, my friend. Stand. Stand! Stand. When all is said and done STAND your ground IN JESUS! Enjoy your day. My friend, Let your day be spent thanking God for the privilege you have of being alive! The privilege of smelling fresh flowers and feeling the gentle breeze whisk past! The privilege of being able to use your hands and fingers to hit the keystrokes on your computer and electronic gadgets, to be able to write on Facebook and Twitter and Blogs and all those high-tech ways of communicating. The privilege of being able to read inspirational thoughts to lift up your spirits, today! The privilege of being counted among the living, today! "To HIM be glory and honor and majesty forever and ever, AMEN!" My friend, I come to report that our God, Jehovah God the MOST HIGH, Jesus Christ Lord of Heaven and Earth, is an absolutely awesome, Never-Cease-to-Amaze-me God! I love the Lord. He is totally dependable. Always reliable. Never underestimate the love the Lord has for you, nor the power He has to chart your circumstances. I praise God for the beauty of seeing another birthday today and welcoming another year. I saw the day. Enjoyed it to the fullest. And then, "it came to pass". My friend, worship and serve Jesus. Only what is done for Christ will last. Hope life is treating you well, today. As an immigrant who still believes I have been blessed to enjoy living in the greatest country on earth, I feel obligated to write this plea to you, my beloved America. I pray you would consider it. Let's get America praying more! Thank you and God bless. "Father God, I thank you. I ask you to forgive my sins. Please heal America and restore our values and morals. Remove hatred from our midst. Keep us safe from threats, and acts of terror. Lord, fill our hearts with love for God and country. In Jesus name. Amen." America: You have a silent weapon, prayer. Please use it. Take prayer out of storage from that hiding place and use it vigorously. The times demand an action. That action is Prayer. Once upon a time the Chambers of the U.S. House of Representatives was used for church services, which included prayer. Once upon a time the Gospel was preached in the U.S. Supreme Court. Prayer was vital to the founding fathers of this great nation that is the United States of America. Prayer still work, America. Do not sit idly and let a good thing slip out of your hands. This is still the greatest country in the world. Now is the time to reach Heaven with your voice. I want to provoke you to adopt the Noon Prayer Campaign for America. Send a collective voice to heaven daily at the same time asking for the same thing. Join the chorus every day at 12:00 noon and say this simple prayer. Please. Change your world today. Pray throughout the day for a few minutes every hour on the hour. Begin at 9:00 a.m., ending at 9:00 p.m. That's twelve hours of messages direct to heaven. See the change tomorrow! Believe me when I tell you Jesus Christ does not tell untruths. God said to pray without ceasing. The Lord said seek and you will find...ask and you will receive...knock and the door will be open. My friend, Stop standing there explaining to people over and over. Start praying to God. Let the lock jump off those doors and you go right through it. I am talking BREAKTHROUGH! "When more Christians start to behave Christ-like, more non-believers will begin to like Christ. And thus began the Jesus revolution!" My Friend, life is good. Life is Beautiful. Live Life Joyfully! Yours is the only life you have on earth. Have a mentality to be happy. Set your mind that you will overcome and be a winner. You were created by your father God, the King of Kings. The reigning King has created you in His image and likeness. You are a phenomenal person. Whether you like it or not you are royalty. It may not always appear that way to you but, you are genuine royalty. Believe it. Nothing can change the reality that you are royalty. Isn't it a fact that a child of a King is a king or queen in the making? Royalty is in your DNA. I cannot tell you enough how much you mean to Jesus. That is why the Lord has made every good thing out here, just for you. Embrace life. Embrace the good out of life. Enjoy your weekdays and your weekends, and celebrate that you made it through. Regardless. You made it through! That says a lot! You are a trooper! Be steadfast. Please make it a priority to attend a church service on Sunday. Whatever you do, or don’t do, find a little time to spend with Jesus. Daily say a prayer and read your Bible. Even if it is no more than one verse, read the Word of God. It is the The Lord teaching you right stuff for righteous living. Therein lies your strength to persevere. God’s peace and His presence will fill you up. Jesus will make His Face to shine upon your face. You would radiate with the sun rays of The Son. When inside of you is shining it shows outside. You shine with happy. My friend, do not let happiness elude you. Go after it. As soon as Satan shows up today looking for attention, immediately say a prayer. Jesus has got your back! Tell Lucifer you are completely booked with preparations for your upcoming meeting with the King. Your schedule is too tight to include jokes and pranks from a forever clownish, small boy who will never grow up! Remind Satan that unlike him who is not allowed to leave Loser's Lane you are travelling on Superior Highway. Do not let any of the temporary annoyances of this life hold you hostage today. Whatever they are—despair, thoughts of self-pity, persecution, trouble, grief, anger, bitterness, sadness, money problem, joblessness—whatever else. You and Jesus make up the majority. And majority wins in the tussle between good and evil. My Friend, believe the report from Jesus, the man who allowed people to nail him to pieces of plank, and He bled and died because of you. Nobody will ever love you more. You can always trust Jesus Christ. Jesus says He will never leave you nor forsake you. Keep your life fortified with the Word of God. Read the Bible daily. Listen only to the voice of God, accepting only what HIS Word says. If God said it, you can believe it, and that settles it! May God bless you to have a fabulous, absolutely fabulous day! Stay prayerful. My Friend, Here's encouragement for you. Acknowledge God in all your ways: God the Father will protect you; God the Son will lead you; God the Holy Spirit will direct your path. Trust the great and Almighty God! Always.